Come join us in downtown Leon,N.Y. in the heart of Amish Country! 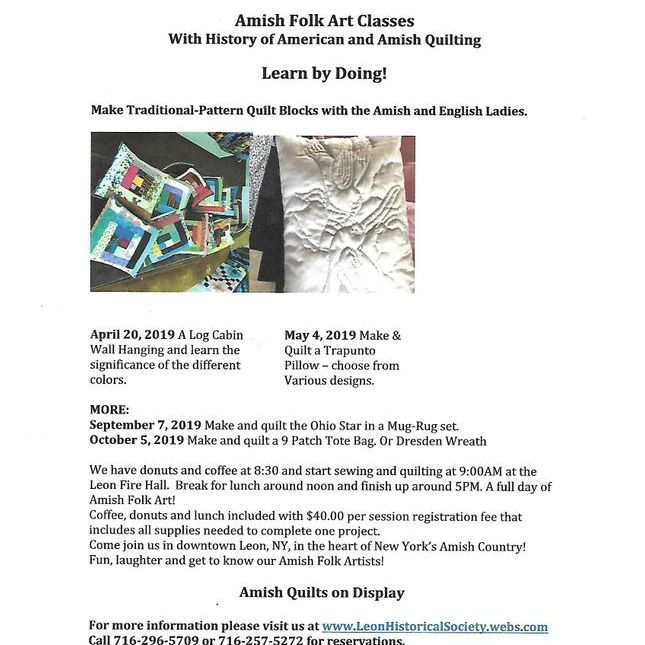 Amish Folk Art Classes with History of American and Amish Quilting! YES Leon is hosting 2 Quilt Parties this Fall! Save the dates! October 6, 2018 and November 3, 2018. CALL- Pat (716)296-5709 or Myra (716)257-5272 to reserve your spot. It was an honor to join the Town of Leon as it celebrated the bicentennial of its first settler, James Franklin, who arrived in the Conewango Valley in 1818. Mr. Franklin was a Revolutionary War veteran who accepted a land grant and built the first cabin with his son, James, on what would one day become the Town of Leon. Father and son began clearing the land and were soon joined by more than a dozen Revolutionary War veterans who settled the area. I want to thank Myra Johnson and the members of the Leon Historical Society for organizing the bicentennial celebration. Myra is James Franklin’s fifth great-grand-daughter. Her daughter, Jennine Sauriol and several of Mr. Franklin’s other descendants also attended the celebration. It is wonderful that the Town of Leon is preserving the history of the Revolutionary War heroes who founded our communities. Shown from left to right are Jennine Sauriol and Myra Johnson, descendants of James Franklin, and Senator Cathy Young. In 1818 the first settlers arrived in what is now the town of Leon. series of special programs and events. interested group, free of charge. century homestead in the wilderness of Western New York State. Leon Historical Society was founded September 17, 1978. The main purpose of the society was to keep an accurate history of the Town and its families, connecting the past to the present. 175 years ago Leon started with log cabins and now within our community, we have a vibrant Old Order Amish Community. 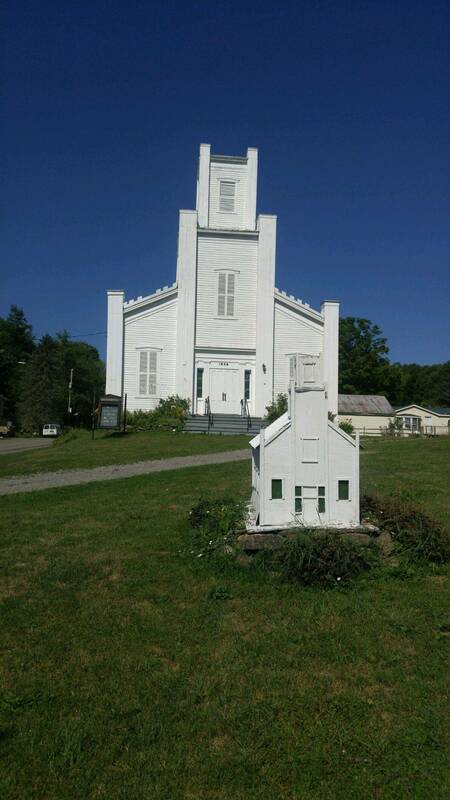 The historical church was built in 1836 and the Grange Hall (museum) in 1903. Both buildings are listed in the National Register. The church and museum are open on Saturdays from May to October from 11AM to 2PM, or by appointment. for bake goods and just take a short walk and see the Museum! Contact Pat Bromley at (716)296-5709 for a private tour or genealogy information. Website created by Pat Bromley Historian and Member. Take a trip back in time with a visit through the Older Amish Community. They live without all the modern conveniences such as electricity, telephones, and cars. Their lifestyle seperates them from the modern world. They emphassize on humility, faith, and family, honest and hard work. They recognized by their plain dress and travel by horse and buggy. Amish produce a variety of good that include Quilts, Rugs, Bake Goods, Candy, Toys, Wood and iron crafts, Furniture, Eggs, Fruits and vegetables. They sell their products from their homes, they have signs in their yards letting people know what they are selling. Amish have a unique way of life which we respect, while on the tour we request that you arae thoughtful and courteous of their way. Come join a tour where one of our Guides will join you in your vechicle and give you 2 hour tour around the back roads and show you the great shops around the area. We will make several stops along the way where you can shop and we will share stories of the fasinating history of the area. Cost: $40.00 per vehicle up to six people with an additional $5.00 per person. Please remember that Amish shops are closed on Sundays, holidays and also for weddings and funerals. Amish accept Cash or Checks, NO CREDIT CARDS. It is against their beliefs to be photographed; we ask that you respect their wishes.